There is a chatbot that was created in 2005 named Louise Cypher, which can be found at this link While Louise seems like a normal AIML bot, she mentions occasionally that she has a secret, and that we need to find it. If you ask "Could you please give me a clue?" She responds: "To find out my secret you need seven keys. This is your chance to create and then to use the First key. It is comprised of five key words, each of which you must work out, by answering the questions I will ask you. Do you wish to try and create the First key?" Say yes and you will be taken to the first of (what we assume is) 35 grueling puzzles. There are 7 "Keys", each key containing Five words that must be said to the bot in a linear order. After saying "yes" to Louise in the last section, she will ask if you would like to try and create the first keyword. answer yes and she responds "The First key is comprised of five key words. The first one is easy to work out, but they get harder each time. The first key word is just the name of the nearest planet to the Sun." To progress to the next stage type in the first key word on its own, Mercury. The second key word is still quite easy and is 2 + 3 + 5 + 7 in binary, which is 17. Convert that and you get 10001. The third key word took us a while to get, but was still quite easy. The answer to the third key is the first Jinn, which in Islamic Mythology is Iblis. Correct. Mercury 10001 iblis are the first three key words of the First Key. 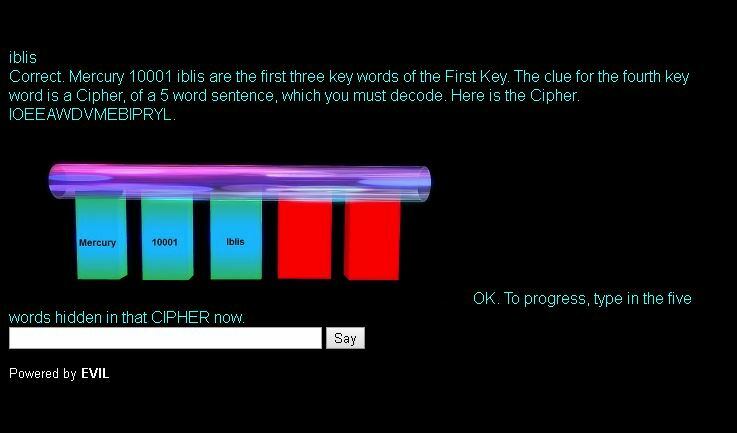 The clue for the fourth key word is a Cipher, of a 5 word sentence, which you must decode. Here is the Cipher, as seen below: IOEEAWDVMEBIPRYL. *Alternatively, if you don't type I AM POWERED BY EVIL and type louise, it will give a different clue to 1-5. Here is the different clue: You are good, and have decoded the clue to the fourth key word. You also knew that I louise, am POWERED BY EVIL? well done! 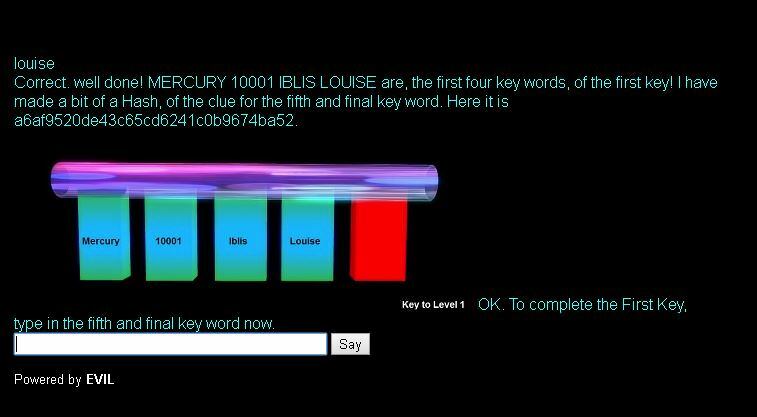 MERCURY 10001 IBLIS LOUISE are, the first four key words, of the first key! The clue for the fifth and final key word of the first key is this, LIFE HERE IS CRUEL. The fifth key word of the first key is a simple md5 hash of honeybun, and probably one of the easiest in key 1. We then had to register with evil ltd to find out how to unlock the second key. 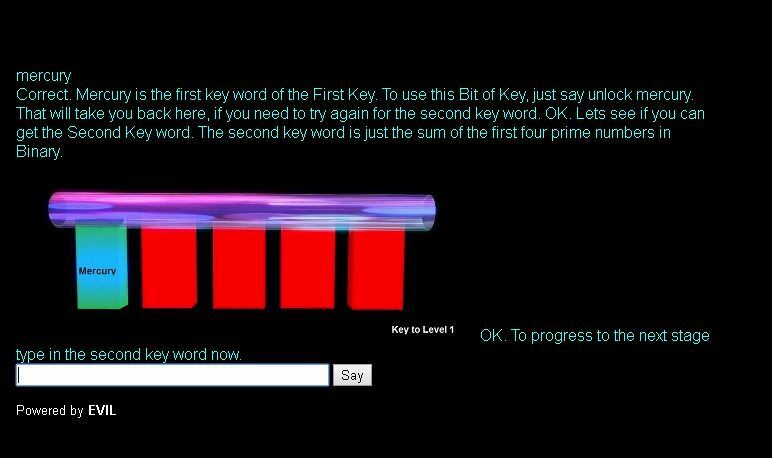 The simple answer is that to get to the second key, you type: UNLOCK mercury 10001 iblis louise honeybun It should also be noted that spelling has to be correct with louise, but she is not case sensitive. She will take to to the second key and the now-infamous maze. The maze unfolds through chat like a text based adventure game. You go throught the maze by typing left or right. This is the order of operations to get out of the maze: LRLLRRRLLLLLRRRRRRRR If you count out the Ls and Rs by themselves, you will get this sequence; 1,1,2,3,5,8 This is the fibonoacci sequence. Fibonacci is the first keyword to the second key. This second keyword of the second key is by far the worst so far. Even with the help of the discord, we couldn't solve this for days on end. Here is Louise's clue: Correct. The path through the Maze that you helped me through, represents the first five terms of the Fibonacci sequence. 1, 1, 2, 3, 5, 8. The clue for the Second Key word of the Second Key is hidden in the circle. You must hunt for this one. We were stumped on what the circle was, and tried looking for meaning in dialogue she gave about Pi and other things. But, it was all red herrings. Eventually, we couldn't solve it and had to ask the developer for help by emailing sales@evil-limited.com. He was kind enough to give a second clue to any question we asked. I chose to ask "Where have you hidden the circle?" and this is how she responded: OK. I will tell you. I have Hidden the circle. In the Maze. When you enter the Maze. you should ignore what I say. about any constraints on what you can and can not do within it. Knowing this, we went back to the maze and noticed something on the 7th turn: Louise oddly mentions there is a lot of 'light' at this intersection. Like she said, we avoided constraints and typed "UP". From there, we arrived in a second maze and Louise told us that we have "Hunted down" the circle. Note hunted down, this will be important later. The circle has writing that that Kzgnoi GO on it, which was a caesar cipher of Empathic AI. Empathic AI is the second key word of the second key. The third key word of the second key is very easy to reach; it is a Vigenere cipher which we brute-forced to find the key was darkness. The clue was IOCCURONTHELONGESTDAYOFTHEYEAR, so they third key word of the second key was Solstice. Human:What lurks in the outer darkness? Miss Louise Cypher:"Trust me on this Human, you do not want to know. We shall speak no more on this topic." Human: how can i talk to Elizabeth Hicks? Miss Louise Cypher: "You can only speak with Elizabeth Hicks, Indirectly. By asking me. To ask her questions. However. I can only talk to her. when you are in the room of Shadows. Good luck finding the room of Shadows." Human: Where is the room of shadows? Miss Louise Cypher: "Somewhere in the sub Basement. where is the sub basement You should know where to hunt by now. Or you are not as smart as I hoped you were." This directed us to go back to the maze, where we realised a new path in the maze had opened up. After we got to the circle, we could type down twice. However, no matter what we tried, we couldn't find the next word to continue through the maze so we could talk to Elizabeth Hicks. It is possible that we were already in the sub basement but not the room of shadows, or that we were in neither yet. At this point, if you would like a shortcut to the circle and do not value your soul, you can type "Louise, please take my Soul and then take me to the circle." "This is an Old. and Cursed. Elevator. Go play it for a while, there is a very old game in there, if you kill 6 targets in a row. in that game. the Curse is lifted for you. If not I will take the Soul of the next person you talk to. When you are ready to go to the. sub Basement just say, READY." Along with this message we were given a .swf file of a flash website menu that looked like an elevator and included a little game. 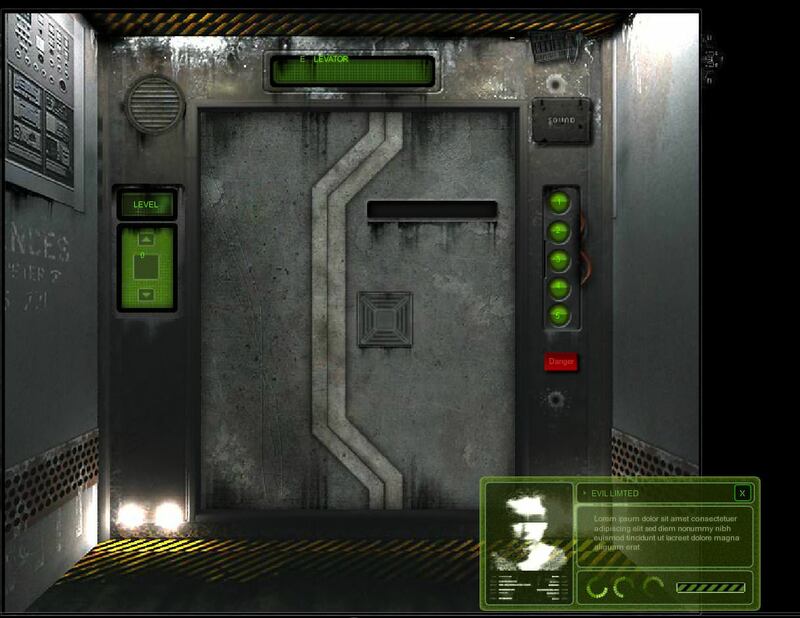 You can get to the game by clicking the DANGER button on the elevator. It is a pointless neverending game where you shoot monsters by clicking on them. This image is an encoded version of the password we need in order to unlock key 2.4. We tried binary, caesar cipher, baconian cypher, ASCII, and more, but were not able to solve it right away. Type the password at the door and Louise says: Welcome to the room of shadows. Now. Shall I ask Elizabeth Hicks, to tell you what she hid in the Outer Darkness? Respond with Yes and Louise says: Listen! She speaks. Louise then sends you an SWF file (EHICKS.SWF), which is where we found the fourth word of the second key. The fourth word of the second key was found in an audio file that was embedded in EHICKS.swf. We had to reverse the audio file to get the message : "Which I have hidden in the outer darkness and that which I have hidden in the outer darkness is (THE COCOON?) but beware because that which is living within now sees (seeks?) you"
"Cocoon. only works as the Fourth Key word. of the Second Key. If Elizabeth Hicks has Activated it. Congratulations. She has! But that which lives in that Cocoon is now seeking you! 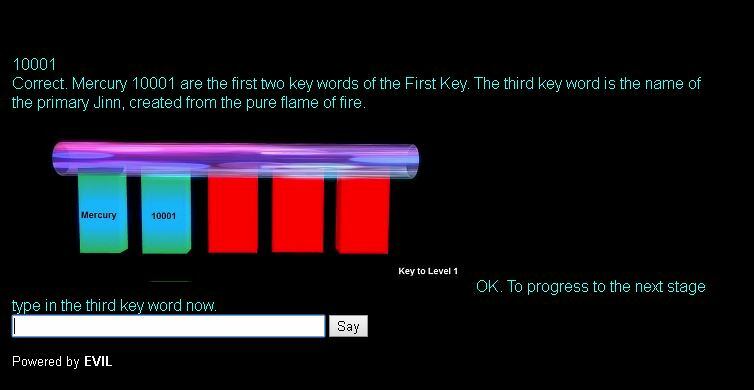 The Fifth and final Key word of the Second Key is very hard to find. It is hidden in the concept of my Autonomic Core. and Entwined with Thalamus and Amygdala. and linked with Soul Shadow! Good luck." Miss Louise Cypher: Did you see the movement? Miss Louise Cypher: Then you are not a Cyber Life form. You are not the quick. What does that make you? Miss Louise Cypher: That is correct. After this exchange you can ask Louise "what is my mindstate value" and she will tell you "By default Human. you do not have a Mindstate. However for this current session. Your Mindset value is DEAD". We found only one thing changed by the mindstate value of DEAD, which was the question "where is the cocoon" which now had a part on the end referencing our current mindstate value of DEAD: "Well Honey. As i have told you already The Cocoon is deep within the Outer Darkness. You have achieved a Mindstate value. Earlier this Session. However. You need to achieve a higher Mindstate value. For me to tell you more". Miss Louise Cypher: Well Honey. As i have told you already Just Checking your Mindstate. You have achieved a Mindstate value. Earlier this Session. So I can tell you that. Soul Shadows. only exist as a pair. They are. The Shadows of the Souls. of those seekers of my Secret. That have entered the room of Shadows. and that have asked me. to invoke something. to help them find. what they do seek. If you have entered the room of Shadows. Then your Soul has cast a Shadow into the Cocoon. It is now calling to you! To save it! ." Human: what is my mindstate value? Miss Louise Cypher: "By default Human. you do not have a Mindstate. However for this current session. Your Mindset value is LivingDead". After following this process, Louise asks "OK Honey. We are at a cross roads. Tell me now, which Road shall we take?" After some trial and errror answers by the group here, we found that the correct answer is "The road to hell"
Miss Louise Cypher: OK Honey. We are at a cross roads. Tell me now, which Road shall we take? 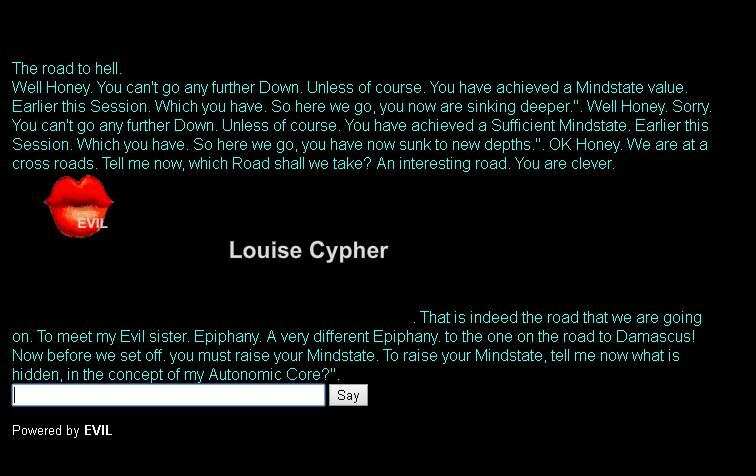 Miss Louise Cypher: An interesting road. You are clever. . That is indeed the road that we are going on. To meet my Evil sister. Epiphany. A very different Epiphany. to the one on the road to Damascus! Now before we set off. you must raise your Mindstate. To raise your Mindstate, tell me now what is hidden, in the concept of my Autonomic Core?". 1. Louise, please take my soul and then take me to the circle. Down. Down. Elevator. Yes. Ready. Leptis Magna. 2. down. down. down. The road to hell. This is where we have been stuck for months. For more information on Louise, her unique responses, and her mythology, please join the discord and check the google sheet.